Ever found yourself needing a place to stash dog poop? 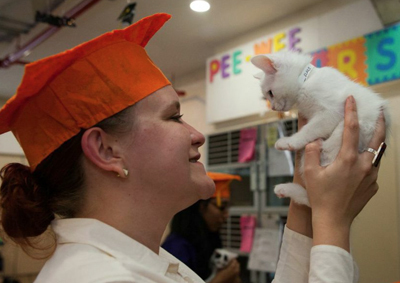 Just in case you’re having a bad day, here are some smile-inducing images from the graduation of the ASPCA Kitten Nursery. I always read labels on food I buy for myself, but I do that for my pets as well. It matters! 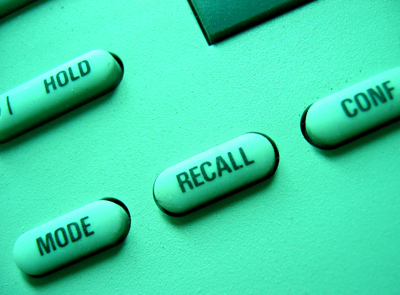 I stay away from brands that have had recalls, and I never buy any pet treats or food that are sourced from China. So, where do you turn for good, natural dog treats? Asking your local pet store about options is a good place to start. You’ll have better luck with the local pet store chains, not the big ones. However, some big pet stores have started to carry more natural options. 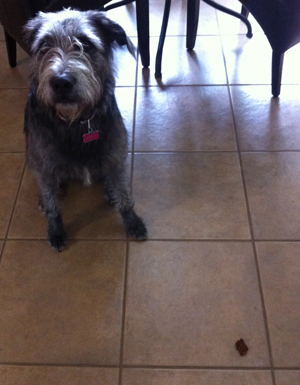 Whenever I get the chance, I test out new natural dog treats for my rescue pup Stella. (Well, she’s the one who eats them. I just give them to her, but she loves her job.) So, I agreed to receive a couple bags of Look Who’s Happy dog treats for review here. 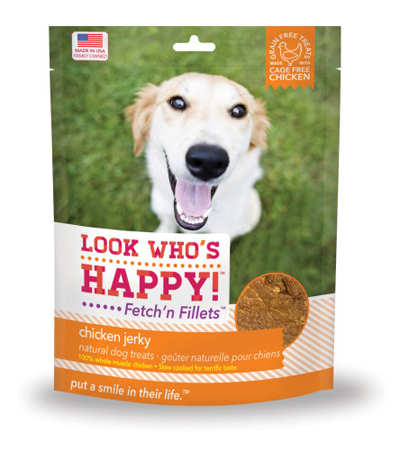 Look Who’s Happy dog treats are made by Big Creek Foods, founded by two brothers, Jeff and Tommy Gay. All treats are made in Gainesville, Georgia. And I’ve got to wonder who does their photography. These are the happiest-looking dogs I’ve seen on packaging! Safe Dog Treats: The brothers operate their own private processing facility according to FDA food safety production guidelines. They even meet much higher standards than the pet food regulations require. Plus, every meat and poultry ingredient is sourced from the USA, Canada or New Zealand (never China), and is USDA-inspected. 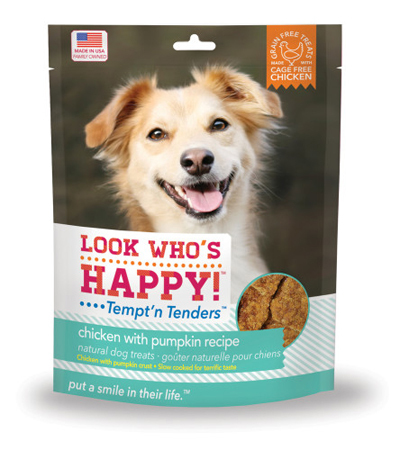 Natural Dog Treats: Look Who’s Happy treats contain no by-products, or artificial stuff (like preservatives, colors or flavors). The treats are also grain and gluten free. Fetch’n Fillets and Tempt’n Tenders are even made with whole muscle meat or poultry. And, of course, the treats are slow-cooked for great taste. Apparently, they are so expertly cooked, even cats want them! 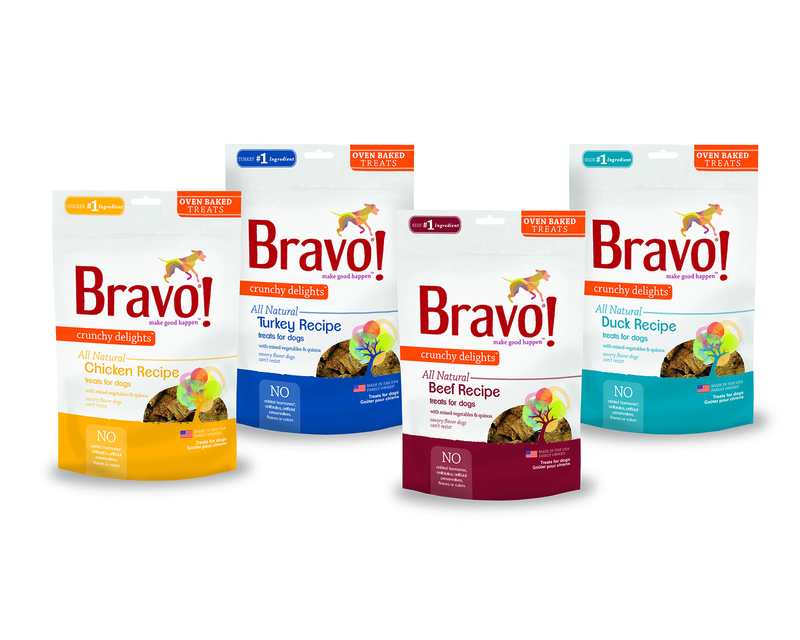 Do you feed natural dog treats? And, does your cat ever try to steal dog treats? 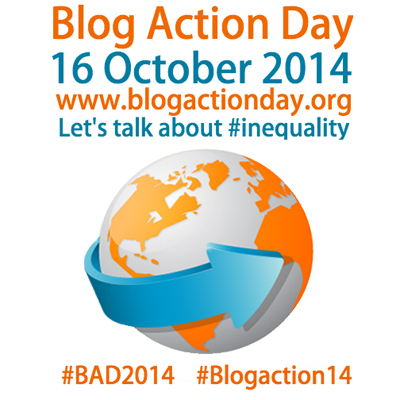 I’m happy to once again take part in Blog Action Day. Light Green Stairs has participated since the beginning in 2007! What does this mean, and why care? If you’re poor, you’re more likely to die sooner than a rich person. Part of the reason is lack of access to health care. But another issue is the inability to afford healthy food, or living in a food desert with no access to healthy food. 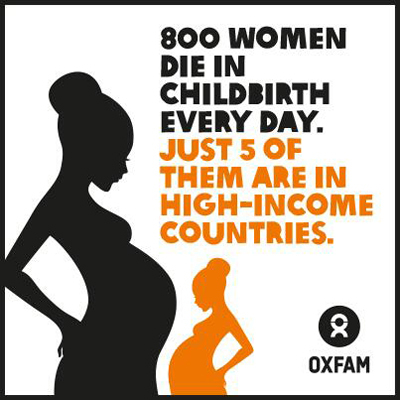 And extreme poverty is very stressful. What else does inequality mean? First, take a look at your own beliefs and attitudes. No one is perfect, including me. Ask yourself how you can work to make things better, not just in the United States, but anywhere in the world where there is suffering caused by inequality. Most importantly, ask yourself how you can help end poverty. Your work could be political, or it may be humanitarian. It could be as simple as volunteering to help someone improve their literacy skills, or donating to a nonprofit that fights poverty. Your Dog Wants Real Meat Too. Stella, my 75-pound rescue dog that everyone says looks like a miniature Irish Wolfhound, barked at the FedEx guy who delivered her Bravo Crunchy Delights treats. 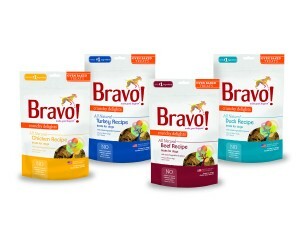 Note: I received a free sample of Bravo treats. But soon Stella caught on that the package was for her. 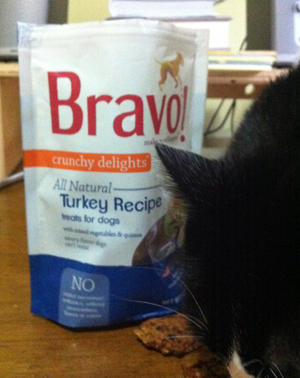 Curious as always, my cat Choco had to approve of the treats first, leaving Stella to whimper patiently! We tried a couple of “leave it” commands, and Stella dutifully waited until I gave her the “get it” command. 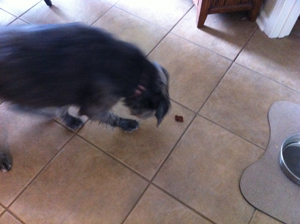 Then, she enjoyed the crunchy goodness! Not Sharknado, but Barknado for Bark Week 2014! Barknado is here. Barknado is here. Barknado is here. Watch the exciting Barknado video from ASPCA. Yes, you guessed. It’s a spoof on SyFy channel’s “Sharknado” and “Sharknado 2.” Well done. Now, watch that cuteness again, and make a pledge at ASPCA to Make Pet Adoption Your First Option. More than 7 million homeless dogs and cats enter shelters each year. They need you. Consider adoption from a shelter in honor of ASPCA’s Bark Week, August 4 through 9. Woof. If you have Netflix, stream “The Paw Project,” and you’ll never see cat declawing as routine ever again. Even if you don’t have Netflix, you can still receive a DVD of the movie when you make a $10 donation at The Paw Project. Or stream “The Paw Project” on iTunes, U-verse, Dish or amazon. When I first adopted my cat Choco more than 10 years ago, I thought that declawing was just something you did to keep cats from scratching you. Thankfully, I was set straight by fellow animal lovers, and my kitty was spared the cruelty of losing his claws. And, I’m happy to say that Choco uses his scratching post. And he submits to claw trimmings without much fuss. Maybe you’re reading this, and thinking I’m some kind of hippie liberal cat-freak, and I don’t know what I’m talking about. It isn’t so. I’ve actually seen a cat declawing procedure firsthand, and while it looks like a quick and simple procedure, the effects can be devastating. 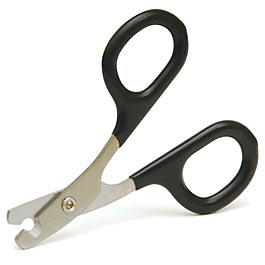 To perform a declaw, the vet uses a tool very much like what you’d trim a cat’s claws with to cut the claw at the bone so it can’t grow back. A medical glue like super glue is applied to the tip, and the cat’s paws are bandaged. Imagine that. You’re a cat. You’re dropped at the vet’s office by someone you trust. You’re put under. You wake up without the ends of your toes. And it hurts to walk. And you can’t do things the same way anymore. You feel like you have a pebble on the bottom of your paw when you walk or stand. And the feeling never goes away. You may become lame or arthritic. You may lash out and develop behavior problems. You may start eliminating on the floor instead of the litter box. You may lose your life in a shelter because no one wants you anymore. Siggi’s! Finally, yogurt without so much sugar. When I’ve attempted to shop for yogurt, it has usually ended with me putting everything back and walking away frustrated. And also, triple-why, do you have to put so many artificial ingredients in there too? Isn’t it supposed to be healthy? Ah, that’s what makes me most angry of all: Thinking about the consumers who put sugary, artificial something or other in their shopping carts thinking they’re doing something good. 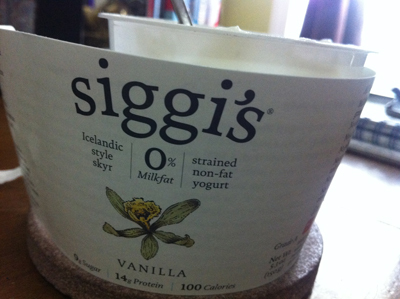 Well, the people at Siggi’s decided to make a good yogurt. One of the few good ones around, no doubt. 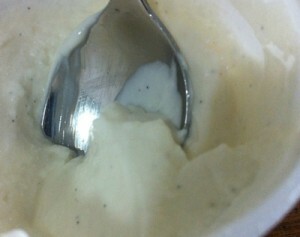 Pardon my photos of Siggi’s Vanilla yogurt. I just can’t photography white things. that this Icelandic-style yogurt tastes good. that it has simple ingredients (pasteurized skim milk, organic agave nectar, Madagascar bourbon vanilla, live active cultures). that it doesn’t have artificial sweeteners or growth hormones. that it has a tab you can pull it make it easy to remove the paper wrapper to recycle separately from the plastic tub. that it doesn’t taste like it’s non-fat yogurt. that a 5.3-ounce container has only 100 calories and 9 grams of sugar. What do you like about Siggi’s yogurt?